As the risk of getting injured is high on playgrounds, it is essential for owners to cover the park surface with the high quality playground mulch to be sure of kids' safety. There are different types of mulch including pea gravel and engineered wood fiber available in the market. 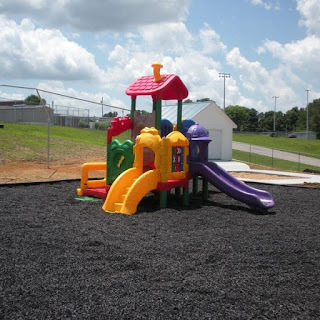 Among all the playground surfacing options, a majority of people prefer to install recycled rubber mulch in their playgrounds. It is prepared with used materials like cycled tubes, van tyres, rubber pipes etc. These rubber products are recycled in order to remove imperfections and impurities. The obtained rubber is further de-vulcanized and shredded for making recycled rubber mulch. Recycled mulch is considered to have an edge over other playground surfacing options. It provides cushioning surface to kids and negates the risk of any kind of injury due to fall from playground equipment. It is impact resistant and durable in nature. Moreover, this mulch is totally bacteria free and does not allow the growth of weed and spread of rodent on the surface. This mulch is widely acknowledged for its ability to absorb moisture up to any extent. You would be astonished to know that the life expectancy of recycled mulch is twice as long as the regular playground surfacing options. Infact, Environmental Protection Agency (EPA) in the United States also support recycled rubber mulch as it is eco-friendly.